To have more understanding of the gospels, Jesus has given these messages explaining the Holy Gospels. These messages were given to Joseph of Jesus and Mary, who also has received Messages from Jesus, Mary and God the Father. These gospel messages are addressed to you, they are waiting for you to read them, rejoice and discover your gift as a child of God. The disciples of Emmaus listened to Jesus on the road as he explained the Holy Scriptures to them. At that time they didn't know that it was Jesus speaking to them. Later on they invited Jesus to have a meal with them, while they were at the table Jesus took the bread and blessed it, he broke it and gave it to them. It was at that moment that they recognized Jesus, at the breaking of the bread. Jesus disappeared and they realized that the Lord had risen from the dead. They said didn't our hearts burn as we listened to him explain the holy scriptures? Let us enjoy these gospels explanation. In the same way, Jesus speaks to our hearts through these messages. We experience great peace when we realize that he is so close to us and we are so close to him. These unique gospel messages as explained by Jesus will become a treasure for anyone desiring to grow in the faith. The gospel messages will mold the soul of anyone with a humble attitude and a desire to have an intimate relationship with God, they are a true spiritual guide that can be consulted at anytime. Holy Gospel Messages as explained by Jesus - The four evangelists St. Matthew, St. John, St. Luke and St. Mark are covered in these messages. There is a general index that helps to find the appropriate gospel you are looking for. The messages are based on the liturgical years of the Church and can be also viewed by Year A, Year B or Year C.
These gospel messages are a beautiful gift to your spirituality, they will improve your religious motivation and your relationship with God. These words from Heaven will touch your heart and soul, they will awaken your spirit to learn to listen to God and to live in His Presence. They will help you to discover the hidden spiritual meaning conveyed in the Holy Scriptures. They will expand the personal concept that you have of the word of God through these holy gospels explanation. 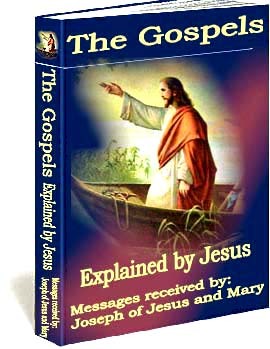 These gospel messages are a teaching for everyone who wants to grow spiritually, this gospels explanation was given to Joseph of Jesus and Mary, but the Lord wants you to read them because they are for you too.